The design process for the new Cohen High School is likely to take about a year, because the building will be a custom design rather than a template modeled off another school as previously expected, College Prep officials said Monday evening. Cohen has been awaiting the construction of its new campus since 2015, when the Recovery School District announced that it would not be combined with a new Booker T. Washington High School and instead given a new building on its current site. That project has recently gotten underway with a new round of conversations between Cohen and RSD officials, and College Prep officials said earlier this month they hoped construction could begin as soon as this year of a building modeled after the Livingston Collegiate Academy building in the lake area. Further preparations have revealed that the Collegiate Academy building’s footprint would not fit on the Cohen site, so Cohen’s building will be designed from scratch, College Prep’s new CEO Joel Castro told the board on Monday night. That design process typically takes about a year, but the delay may benefit the school by giving its community more opportunity for input on what they would like to see in the building, Castro said. The school’s facilities committee and administration had already agreed on a request for Cohen students to remain in their building during construction of the building in the site’s green space, and the board discussed that recommendation further on Monday as well. Castro reiterated that the possible swing spaces offered by the Recovery School District were too small for the school’s current enrollment, much less to grow, which could harm enrollment at Cohen for years to come. “We’re trying to go in the opposite direction, not a decrease,” Castro said. The new building will be designed to accommodate at least 510 students, Castro said. The gym will likely be inside the building, but Cohen officials have requested it be on the first floor, not the third, to make it more accessible for after-hours events. Cohen officials also expressed admiration for newer school’s black box theaters that can be used for both a band hall and a dance floor. The RSD is paying for the new building using the last of the FEMA money for new schools, so they have final say over design decisions, said College Prep board member Celeste Eustis. That said, the College Prep and facilities committee will remain in frequent contact with them throughout the process, conveying the opinions of the school community. Keeping the students at Cohen during construction will add about $6 million — in both safety expenses and delays to the demolition of the old campus — to the school’s $30 million price tag, officials have said. Moving Cohen kids elsewhere, however, would come with a similar cost to add modular buildings at the temporary site, and would prevent the Recovery School District from offering those swing spaces to other schools, so keeping Cohen on site is considered preferable for both the school and the Recovery School District. 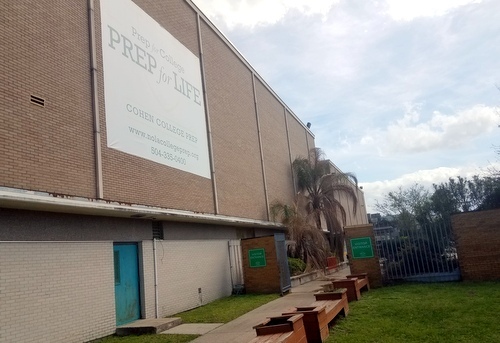 In an unrelated action that was as perfunctory as it was historic, the College Prep board voted to return the charter network to the governance of the Orleans Parish School Board from the Recovery School District next year. The move is mandated by state law passed two years ago, so the board had no say on the matter, said chair Peter Harding, making the vote essentially a formality. The College Prep board is also seeking new members, and its nominating committee will convene soon to begin recommending them now that the major issues of selecting a new CEO and restarting the Cohen construction project have begun. Harding urged the board to consider finding more African-American members for the board, as well as younger members.